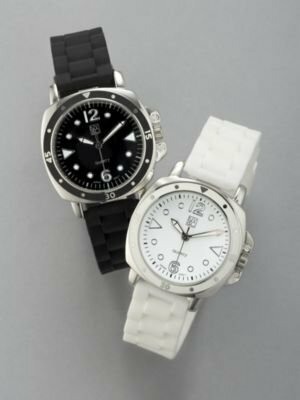 This bright white watch, part of ToyWatch's Plasteramics collection, lends a modern, sporty touch to any summer ensemble. Buy it for $195 at toywatchusa.com. Want the look for less? Try this Inmotion Sports Watch from New York & Co. instead. It'll set you back a mere $19.95. Thanks to reader Srujana for the tip! Related Deal: 30% Off EVERYTHING Limited Time Only - Shop Now at nyandcompany.com. As I predicted back on January 1, 2009, the estimable Rodarte sisters will design a line for Target! The 55-piece Rodarte line for Go International will launch at most Target stores nationwide and on target.com on December 20, and will be available through February 6. Prices for Target's Go International Rodarte collection will range from $9.99 for knee-highs to $79.99 for a leopard print jacket. Think chic attire for all your holiday fetes. "It's very feminine, yet very modern," says Target spokesman Joshua Thomas. "The collection incorporates a rich mix of patterns and fabrications and everything from sequins and bows to faux fur. The key with Rodarte is layering." My crystal ball is murky when it comes to envisioning the actual clothing that will result from this collaboration but I have complete confidence that Kate and Laura Mulleavy will make it work! I get a lot of requests for stylish yet affordable outfit ideas for the office, so I'm going to try something new here and feature work-related attire every Wednesday—hence Work-Chic Wednesdays! To kick things off, here are three business-casual looks featuring items under $100 (I may have gone a tad over with a few of the bags but sharp accessories are one place you can splurge on occasionally.) Each outfit would work well for an interview, too, with the exception of outfit #3 (needs a blazer). Click any image for details on any of the items shown. Layer luxe-looking accessories atop a basic, modest dress for a look that's sure to win you the corner office, someday! Black and white is always a chic choice for the office. Keep the look sophisticated yet exciting by adding a bold red bag. What's more, this entire outfit features plus-size items. For summer, try a sleeveless top in a casual office setting, just keep the rest of your look neat and polished. Add a blazer or cardigan for important meetings.